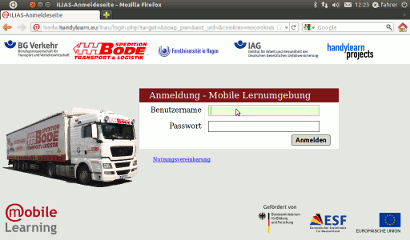 Project description: We created an e-learning platform for truck drivers. We created an e-learning platform for truck drivers. Truck drivers have often long waiting times. In addition to statutory rest periods, truckers often involuntary pauses: between two trips or while the customer loads or unloads. The drivers spend this time spans mostly in the cab, and there is not much to do. An ideal time for learning, especially for work-related content: if you are in the application context, you will memorize it much better. Driver have special interest in topics like preventing micro sleep, better vision, better nutrition, fitness sport, behaviour in case of breakdowns and accidents, dealing with stress and conflicts. And the truckage company also benefits from well-informed drivers. To find relevant topics, drivers and the transport company were interviewed. Additional topics were contributed by the insurance association. The drivers got a netbook which they can put on the shelf in front of the passenger seat. A netbook is small and light enough to put it together with other stuff in a bag and take it away when you go to the service area. And a netbook is also big enough to watch films, to communicate in the forum, in the chat or edit exercises. The drivers connect to an Internet-based learning platform. Truck drivers want to learn close to the real practice. Main Course contents are videos that are interrupted by knowledge queries. In addition, there are also vodcasts: Short presentations with an added voice by an employee. The system boots faster, and the switch-off process is also faster. The user interface is easier to handle and also works well with smaller screens. There are fewer malicious viruses and less danger of accidental reconfiguration. The truckers connect to an Internet-based learning platform. After evaluation of the teaching concept we have chosen the learning management system “Ilias”. We adapted Ilias for this purpose: larger text, stronger contrasts. we have hidden many unnecessary details, so the eyes are not distracted from the important information. The Institute for Work and Health (IAG) of the German Statutory Accident Insurance (DGUV). The DGUV manages more than 75 million to work, travel and student accidents and occupational disease insurance. The IAG develops and advises within the DGUV health and safety in the workplace. Nearly 200,000 companies are members of the Professional Association for Transport and Transport Economics. Prevention is a statutory objective, therefore it offers an extensive training program. But is is difficult to include Truck drivers and other “mobile workers” into classical education. The truck transport company with 160 employees provides logistics service for commercial customers. For example they supply paper rolls for printing press machines just-in-time, so that the client can save storage space. This modern logistic services also means high demands on the reliability of transportation, which can be met only with fully-qualified employees. 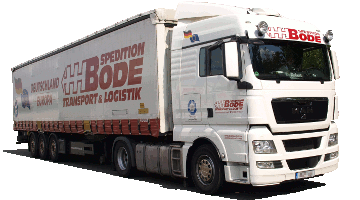 The company Bode want to continue to remain a pioneer here and expand the quality of their services further. In the pilot project, the learning platform is used by 25 truck drivers. The University has approximately 80,000 students, more than any other university in Germany. The Institute for Education and Media Research is responsible for the educational concept and performs the scientific evaluation. Handylearn Projects develops mobile learning applications since 2005. It consulted during project planning, set up the learning platform and provided technical support through the whole project.